Search neighborhoods are necessary for almost all types of interpolation. When making a prediction at a new location, you do not need to use all input points to calculate the prediction. Instead, only points that are close to the prediction location need to be used, and the search neighborhood allows you to choose the points to be used. Using search neighborhoods also speeds up the calculation of the predicted value. For 3D interpolation methods, the search neighborhood must be able to identify the closest neighboring points in 3D space when predicting to a new location. These neighbors are identified using a 3D search neighborhood. Sector type—The number of sectors of the search neighborhood. In each sector of the search neighborhood, the neighborhood will search for the closest points to the prediction location. Once the minimum number of neighbors have been found, the neighborhood will continue to search for additional neighbors until either the maximum number of neighbors have been found or the distance to the next neighbor exceeds the radius distance. Sectors are used to ensure that neighbors are identified in different directions around the prediction location. Sectors divide the map into several different regions, and each region will look for neighbors independently of every other sector. For example, if you use four sectors with a minimum number of neighbors of 2 and a maximum of 3, at least 8 neighbors (2 per sector) and at most 12 (3 per sector) will be used for the calculation. Using neighbors from many sectors ensures that neighbors come from different directions around the prediction location. This allows more accurate predictions by using a better variety of neighbors. 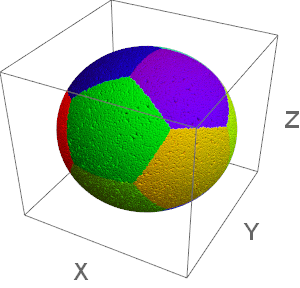 Each sector type is based on one of the five Platonic solids (and a sphere), which divide 3D space into equal regions. 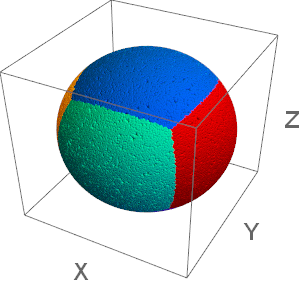 The images below show how each sector type partitions a sphere of points. The One Sector (Sphere) sector type corresponds to not using any sectors. Neighbors will be chosen based only on their distance to the prediction location. The Four Sectors (Tetrahedron) sector type divides 3D space into four equal regions, and neighbors are found independently in each of the sectors. 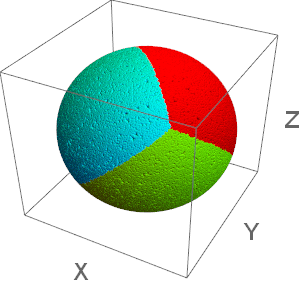 A sphere is divided into four equal regions (sectors). The Six Sectors (Cube) sector type divides 3D space into six equal regions, and neighbors are found independently in each of the sectors. 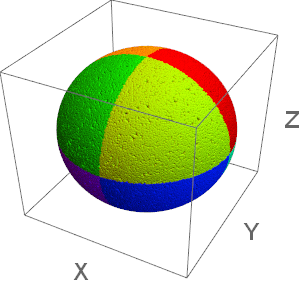 A sphere is divided into six equal regions (sectors). The Eight Sectors (Octahedron) sector type divides 3D space into eight equal regions, and neighbors are found independently in each of the sectors. A sphere is divided into eight equal regions (sectors). The Twelve Sectors (Dodecahedron) sector type divides 3D space into 12 equal regions, and neighbors are found independently in each of the sectors. A sphere is divided into 12 equal regions (sectors). The Twenty Sectors (Icosahedron) sector type divides 3D space into 20 equal regions, and neighbors are found independently in each of the sectors. 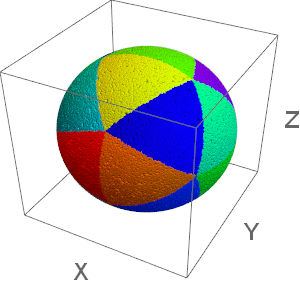 A sphere is divided into 20 equal regions (sectors).